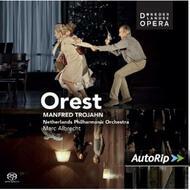 Orest, the opera by the German composer Manfred Trojahn, was written for the Netherlands Opera. The world premiere took place in Amsterdam, amid spectacular splashes of gore and commensurate splatters of sound, in December 2011 and this recording was made during those performances. The Netherlands Philharmonic Orchestra is conducted by Marc Albrecht, and the title role of Orestes is sung by the celebrated German baritone Dietrich Henschel with Rosemary Joshua as Helen. Manfred Trojahn�s Orest is a music theatre work in six scenes set to the composer�s own libretto. This 2011 premiere production by Netherlands Opera was directed by Katie Mitchell with set designs by Giles Cadle. Netherlands Opera commissioned Trojahn�s sixth opera to finish a series that focused on the House of Atreus, rounding off the cycle of violence by adding the murder of Helen of Troy to the carnage surrounding Iphigenie, Idomeneo and Elektra. Trojahn�s libretto is based on Euripides and the narrative follows the Greek story closely. The subject matter, with its myriad musical and literary allusions, seems to have steered the composer towards a harmonic language more rooted in the past than he might otherwise have adopted. Certainly Richard Strauss�s influence is amply audible.